Here’s a sneak preview of the new layout we’re designing as part of our work to improve operator licensing self service. In a recent post, we told you about a major project to improve operator self service and allow new applications to be made online for the first time. We’re working with the government’s digital team to make sure the system is available through the Government’s website, GOV.UK. Our current focus is to review processes and design new screens to make it easier for you to navigate through the system. We started with the steps that you make during a licence application and have been developing the screen layouts. Here's the new layout we’re working on. This particular screen is the ‘your business’ section of a new licence application. Along the top of the screen there is a progress indicator. This tells you where the application is up to and which sections are complete. It will be a familiar navigation tool if you’re used to making online applications. You can skip sections and return to them when you have the information to hand. You’ll also be able to amend your licence application at any point before you submit it to the Traffic Commissioner or Northern Ireland Transport Regulator. At the left side of the screen, a menu shows which sections you need to complete. 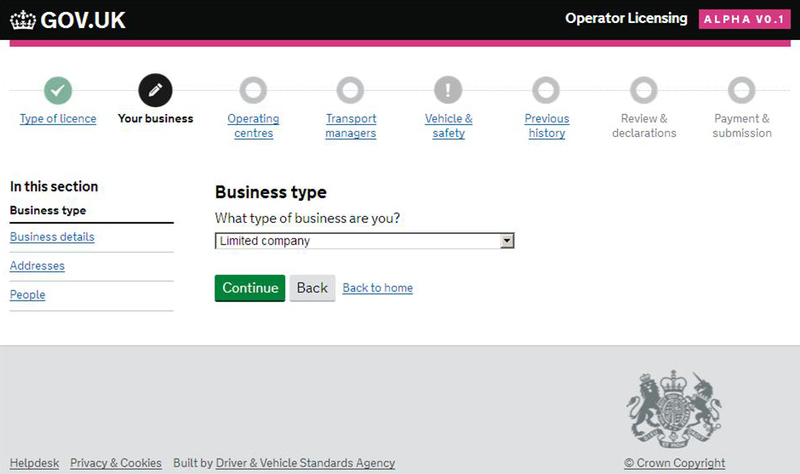 The screen shot shows a question on what type of business will be operating the vehicles. We’re also designing guidance and tips for these screens so that help is at hand during the application. After completing all the sections, the system will prompt you to pay the fee before you submit your application. You can upload any supporting documents, such as your newspaper advertisement, with your application. Give your feedback on these developments. Your comments will help to inform our changes.